I can now act and think both globally and locally, creating theatre that is vital to more people because it is theatre that bridges communities, finds connections, and waits for society to catch up. One month ago today, (exactly one month ago down to this minute) Rebecca and I drove from Baltimore to Dulles International Airport, boarded a plane for Istanbul, transferred to a plane to Tashkent, and arrived there in the wee hours of April 27th. In many ways, our journey was all leading up to the evening of May 1st, when the Ilkhom Theatre of Mark Weil and The Seagull Project would present their collaboration, an improvisation around my new script Dance On Bones. As you may remember, Dance on Bones was initially supported by the Likhachev Foundation with a cultural fellowship in St. Petersburg (see blog posts from May 2013), and was in an early draft when selected by The Seagull Project and the Ilkhom so I had arrived not knowing exactly what forces we were mingling with in this script. Dance on Bones is 37 interlocking poems inspired by the jazz scene in St. Petersburg, Russia (see my Dance on Bones research page as well as numerous posts from May/June 2013), but set in a world in which cities have disappeared: are we in St. Petersburg or New Orleans or St. New PeterOrleansBurg? 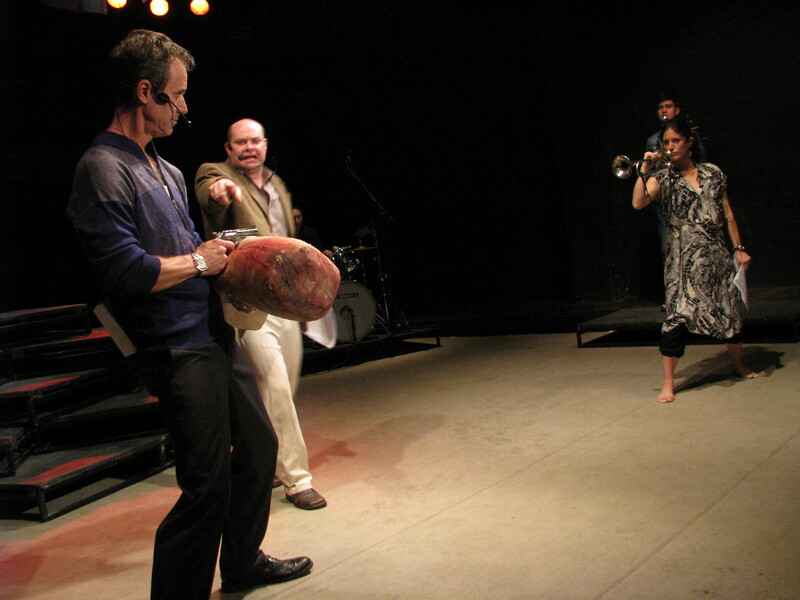 An early draft of Dance on Bones was prepared for the Festival of American Culture at the Ilkhom Theater of Mark Weil, Tashkent, Uzbekistan in April/May 2014. The pages of the script are the template for performance. Some can be performed as monologues. Some can be performed as dialogue with indentation indicating changes of voice…Some of the pages may be stage directions. Some of the pages may be told through images, movement, or puppetry. The pages included after this point can be rearranged or shuffled into a random order or performed in a different order each time or arranged to articulate different ideas. 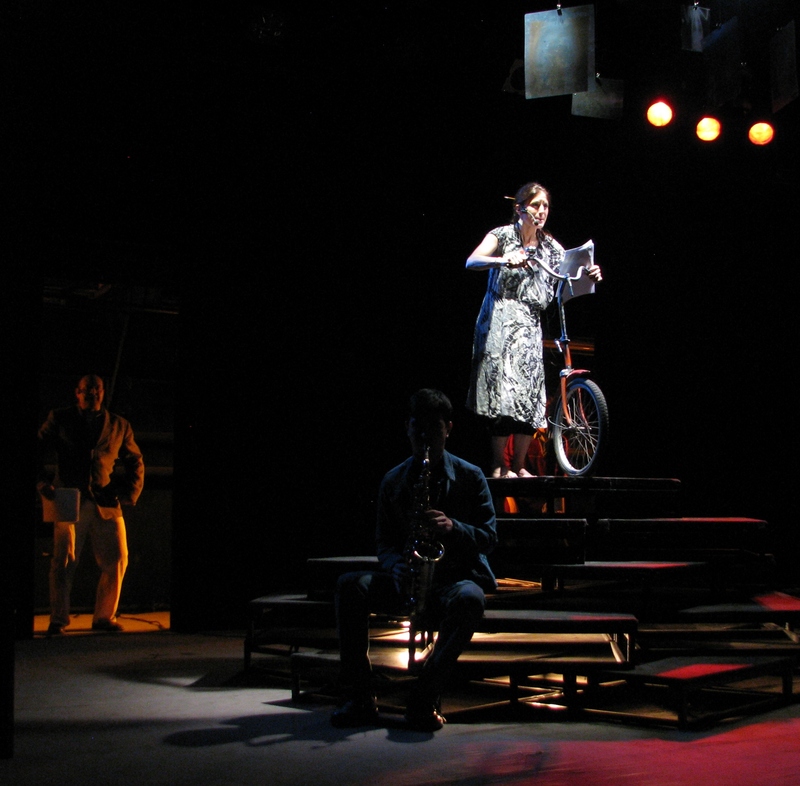 Music is a character in this play. 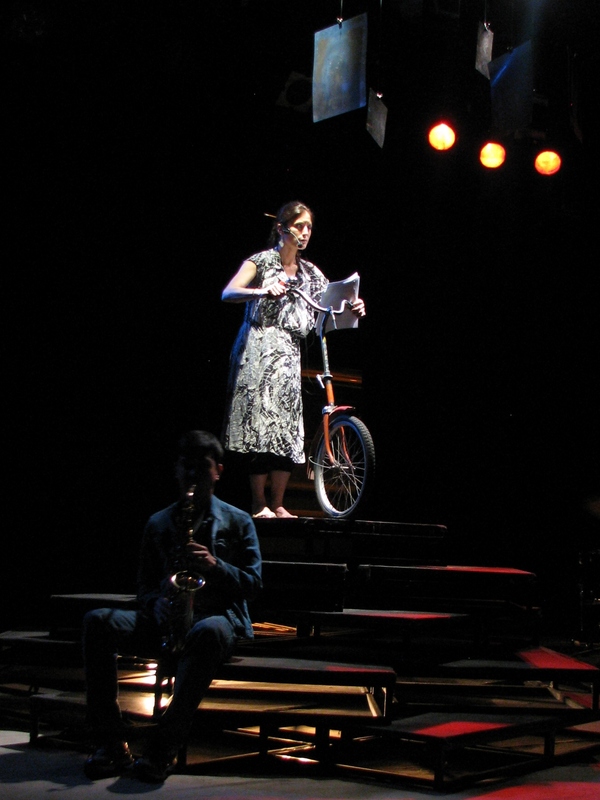 Music shapes the structure and themes of the play. I can imagine a version in which a Superman-esque theme is played under the Adverts rather than a Stalin-esque theme; they are, after all, both Men of Steel. 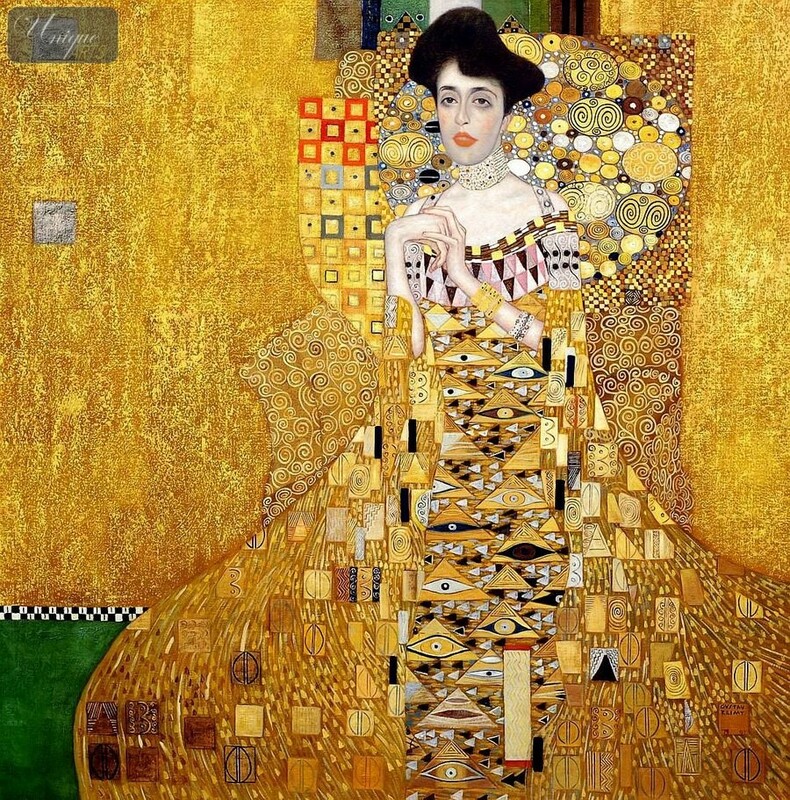 The connections between many of the poems in very clear, some connections really opened up my eyes to possibilities: such as the pairing of “Gavri’s Losing Voice” with “The Invention of Jazz,” making that her story. But there are whole arcs that remain muddied, that I can work to strengthen the connection now that I’ve seen where the gaps are and how clear connections provide the network by which artists and audiences navigate this piece. This is a funny play and a sad play. I knew it was dystopian and political, but I didn’t know how funny it would be, or how the totalitarian aspects of the script would draw sadness from the actors. There are many more ideas, but it is with these ideas that I now head back into work on this script. So here are three segments from the Improvisation of Dance On Bones at the Ilkhom Theatre in Tashkent, Uzbekistan; a glimpse of the live experience via the reductionist form of video. The video contains three excerpts: “The Man With the Ham Part 1,” “The Floods, Part 1,” and “The Man of Steel.” This video was recorded and produced by the Ilkhom Theatre. 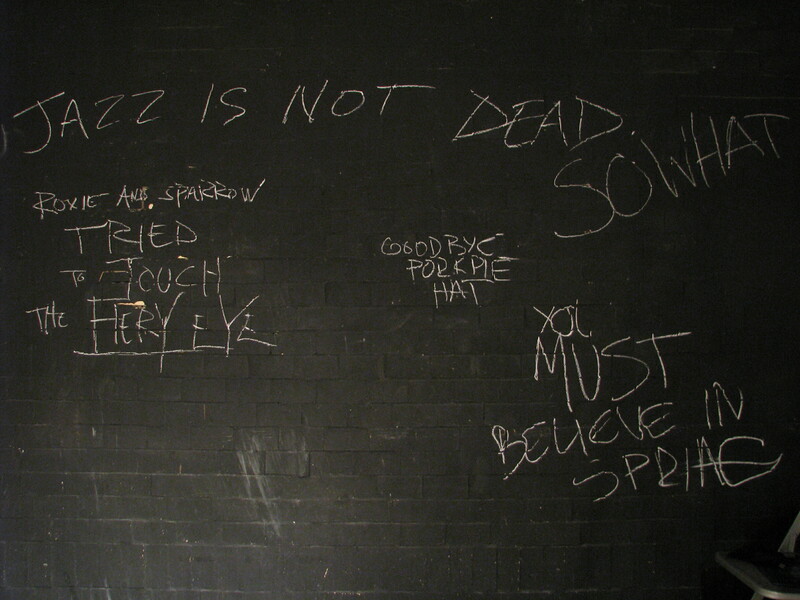 From the Program note (which I did not write): Dance on Bones is a fragmented glance at a dystopian world, where authoritarian control reigns supreme, the world fights back against the loss of culture and memory, and jazz remains the soul and saving grace of the people. Inspired equally by George Orwell, William S. Burroughs, American Poetry, and Miles Davis; Dance on Bones is a unique look at the importance of humanity in a world of lost souls. Special Thanks to the Ilkhom Theatre’s tech and design staff whose quick work and acrobatics helped everything come together quickly, and especially to Boris Gafurov and Irina Bharat for opening up the Ilkhom Theatre to Dance on Bones. An audience member compared the work to that of Ken Kesey, esp Cookoo’s Nest world populated by the inmates. Dance On Bones audience member asking a question. Dance on Bones actors, directors, and playwright take questions from the audience. Someone asked if I wrote this piece about Uzbekistan, because they have their own stories of the Man of Steel and Trees and Jazz. The actors spoke about their work on the piece: a journey from disorientation to connection. Then we journeyed down the street to Chez Aziz where we used every table and ordered so much beer they ran out of mugs (new mugs were there the next day). 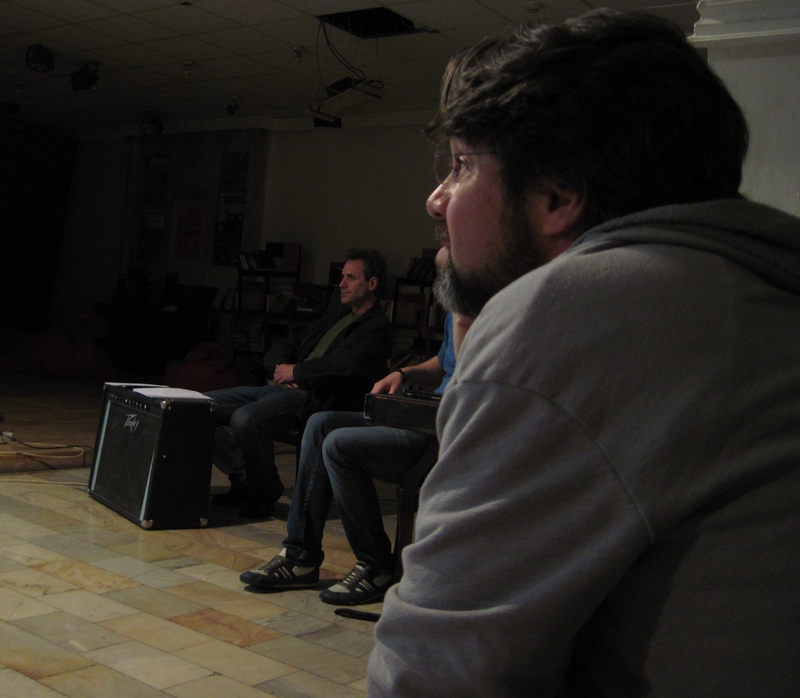 Sanjar Nafikov on left, and me at Ilkhom Theatre. Sanjar Nafikov was the musical director for Dance on Bones and was working with the team from my first rehearsal. He is a versatile musician who in a member of a quartet that blends jazz ideas with Uzbek instruments and tones. Below is a video from their concert at the Ilkhom Theatre celebrating the release of their eponymous CD. The day after we the presentation of Dance on Bones, Rebecca and I joined The Seagull Project folks for a trip to Samarkand, a mystical city filled with magical architechture. We managed to get the high speed train there which arrived in 2 hours. On the way home we took the regular train (3.5 hours), which was enough time for a remarkable conversation. The train cost round trip was $40 and the tour of Samarkand with a guide and bus was $55/person. But that trip will have to wait until the next post. 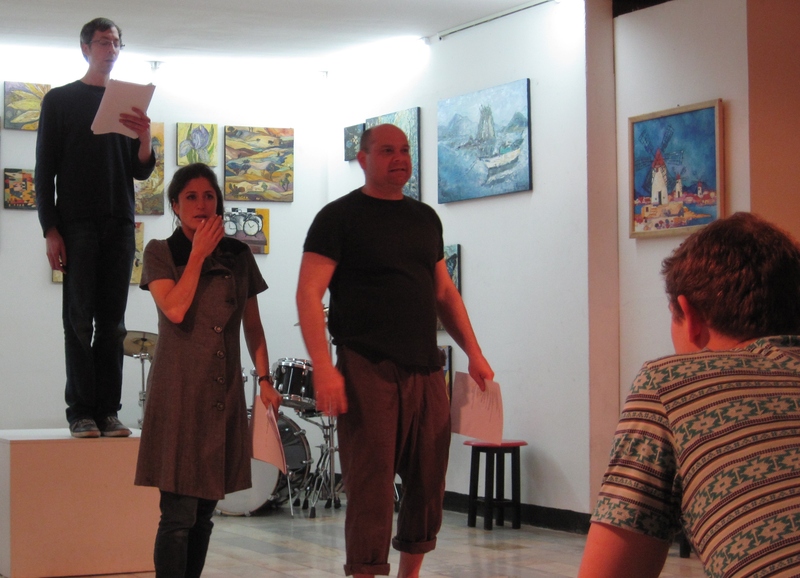 As part of my residency at the Ilkhom Theatre of Mark Weil in Tashkent, I offered a workshop on Playwriting in the 21st century as well as Playwriting in the U.S.. I prepared to talk about many things, and then the evening before realized that, “What I want to talk to people about might now be what they want to learn about.” I prepped my thoughts, put them into a presentation on my laptop, figuring photos would help cross the language barrier, and knew that tomorrow when I sat down with the Ilkhom’s students and community that I would let them ask me questions and if any of their questions and my prepared ideas crossed, then we could have an interesting conversation AND visual aids. 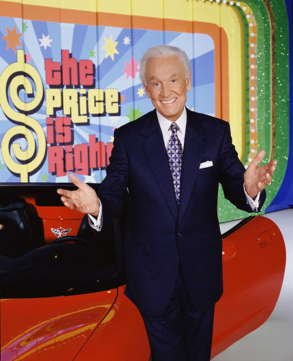 And The Price is Right (the Bob Barker years), from which I adopted the structure for a play. And after that, we talked for the next 90 minutes about writing, life, and how we turn our writing into work for others to interpret. -Keep writing. The only way to know what different responses you can get is to keep writing and getting different responses. -Anything quick. If I take time to cook, I stop thinking. If I write all night I must continue to eat or I cannot keep working. -That’s tough. With my early plays there’s definitely things that were drawn from conflicts I was acting out, but I learned pretty quick that creating conflict to put in my writing was a good way to lose my friends. “Do we even need scripts, or fixed scripts, can’t actors or ensembles work without them? -Sure they can work without a script, in many cases very well, but I’d like to think that there’s still some artists that would like to create within a structure and engage with some shared ideas, because if these artists aren’t out there, then I’ve got nowhere for my art to go; so I try and write differently each time to keep myself on my toes and hopefully collaborators trying new ideas right alongside me. The audience asked good questions, personal questions that probed my routines, my ideas, and my relationships, as well as my work. I can only hope that a few of those in attendance discovered an idea or two in what I was saying. I’m also very grateful to Irina for bravely translating my crazy ideas, looking at me with a cocked eyebrow when I became to ephemeral or specific in my jargon. Somehow I love thinking this way, figuring out clear, direct ways to discuss elusive, nuanced concepts. So now that my workshop was over, I jumped back into the final tech hours before the presentation of Dance on Bones. The Reading of Dance on Bones was bookended by the presentations of two other new plays by playwrights from the U.S.: Caridad Svich’s Archipelago and Mark Chrisler’s Worse Than Tigers. As discussed in my previous post (and Gavin of the Seagull Project points out on their blog), these presentations do not resemble readings in the U.S. any way other than the actors have scripts in hand. For this particular trio of plays the decision was made to present Archipelago in Russian, Worse Than Tigers in Russian and English, and Dance On Bones in English. 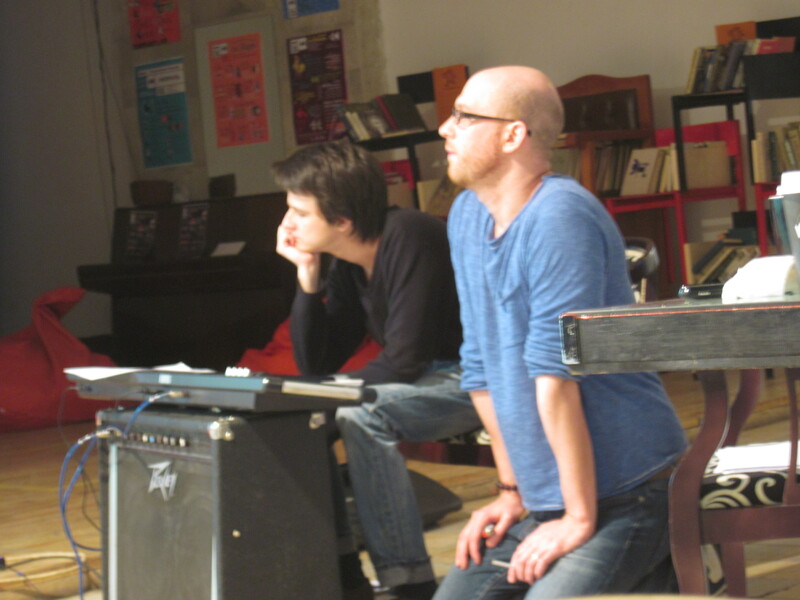 The improvisation of Archipelago was helmed by Boris, Ilkhom’s Artistic Director, and featured two actors that are part of the Ilkhom’s company. 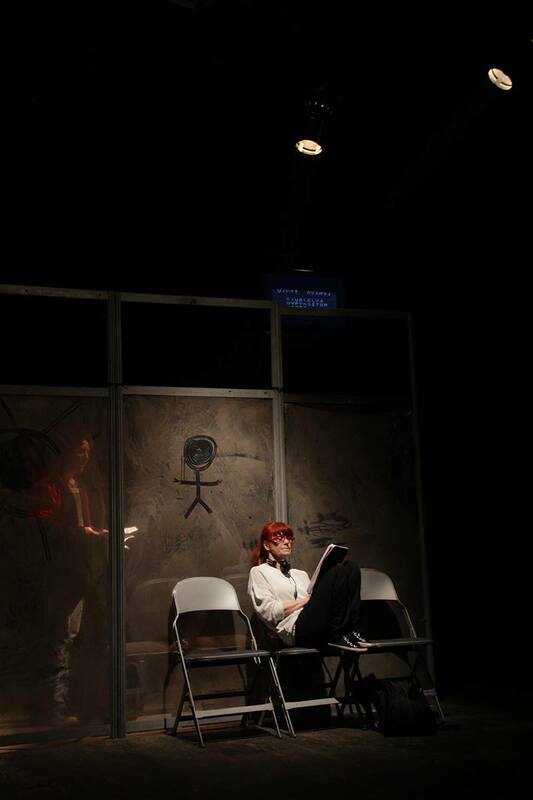 As with all of the improvisations the design focused on one major theatrical accent, in this case a dusty, plexiglass wall that separated the space (and that the actors could draw on). 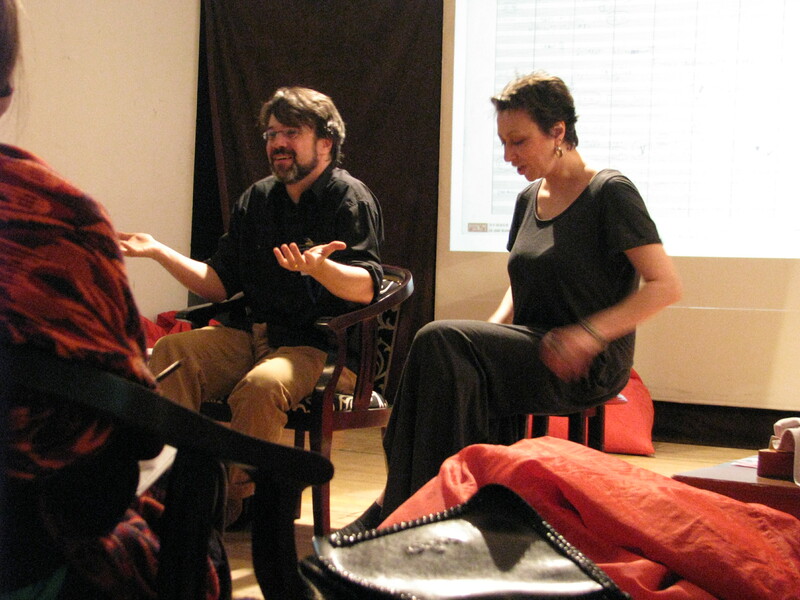 Photo from Improvisation of Caridad Svich’s Archipelago. Photo by Ilkhom Theatre. This was an intense presentation from the actors, punctuated by gravely rock ‘n roll and video projections of revolutions, battles, and departure announcements for distant lands. The actors played these nuanced scenes off of each other finding their moments of connection and disconnection during their brief moments together. I read the script before seeing the reading in Russian, but I also enjoyed the distance another language put on this play, no less poetic but my moments of investment lay solely with the actors finding their moments of investment and not on my understanding of their words over-riding the connection these actors found with this text and Svich’s ideas. A few nights later, we saw the reading of Mark Chrisler’s Worse Than Tigers presented bi-lingually between American and Uzbek actors from the Ilkhom’s company. Tyler (one of the directors of Dance On Bones) was featured in this reading as the uber-American-macho-cop, performing his role in English, while our upper-class couple performed their roles in Russian (stage directions were also divided bi-lingually). This dynamic added an interesting outsider-invader/insider feel to the already potent script about the empty lives of the top 1%. It really is remarkable what these artists (director, actors, designers) are able to accomplish and pull out of a script in such a short period of time. This also wouldn’t be possible without the work of John Freedman connecting the Ilkhom to American playwrights. The third improvisation featured was Dance On Bones, which I will get to in the next post…I hope it’s worth the wait. During dinner break on tech day, Rebecca and I caught a cab from the Shodlik Palace Hotel to Cafe Shashara, a restaurant recommended by the woman at the front desk. The 5-minute ride cost 5000 SOM (about $2) and when the driver turned off the main street onto a dirt road we wondered where we were headed. As the driver stopped at the gate, we began our descent by the waterfall and realized two things: 1. This was a beautiful, cool outdoor restaurant 2. This was a restaurant that would probably be very expensive to the locals (it felt a bit touristy) and would not be serving the more down-home cuisine. The waiters didn’t speak much (any) English, but with my few words of Russian (and photos on the menu) we ordered an elegant dinner of Lagman (soup), Bread, Pickle Salad, Lamb Kabobs (from the ribs), and Sarbast beer. The lamb was so tender, I can’t remember ever having better. The dinner and atmosphere was lovely, with waiters in crisp shirts and bow ties running entrees from the kitchen to the tables, but the bill for two was about $45, extravagant for an evening in Tashkent (where we regularly ate very well for around $5 per person), but in our minds well worth it for the experience. Our waiter called us a taxi back to the Shodlik and a few minutes later we were back at the hotel and I’m back in tech, but this would not be our last visit to Shashara. A big part of this festival is something that the Ilkhom Theatre calls “improvisations.” Mostly they just call them readings, but it would be hugely misleading to an American theatre-goer to give it the title of such. It is only a reading in the sense that people have scripts in their hands. Other than that, there is mostly full tech, blocking, and heavy acting. Everything is not at full production quality, but it’s enough to give form to not just the words, but the ideas. As for my work, I arrive at the gallery for the first day of rehearsal about 45 minutes early and one of the actors is already in the space working on one of the more challenging passages in Dance On Bones. 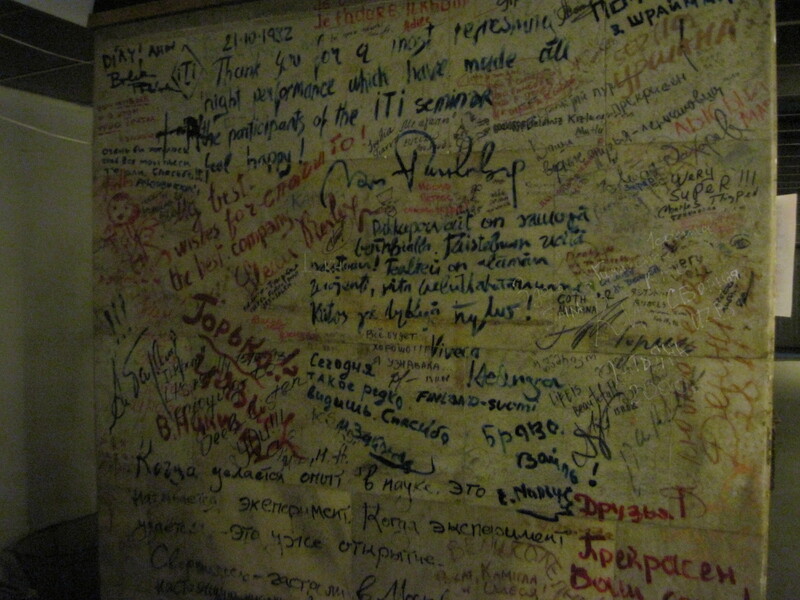 I quickly realized that having the playwright watching you make discoveries might be offering a bit of pressure, so I went downstairs at the Ilkhom and perused the graffiti from artists from around the world (Peter Brook is in there somewhere). When I return to the gallery, the other actors had arrived and, indeed, Alex, CT, Dave, and John are all working, digging, and exploring the textures of Dance On Bones. 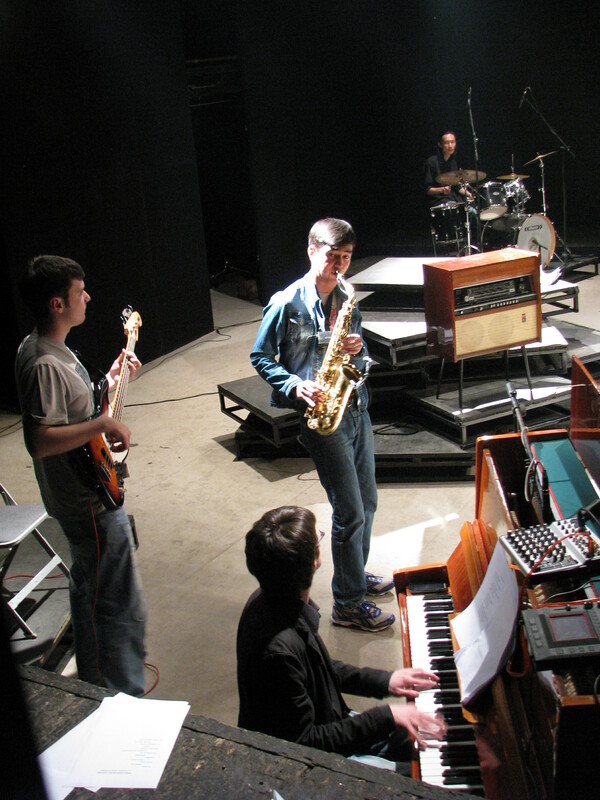 CT, Alex, John, and Gavin (L to R) in rehearsal. For the next several days, I was learning, seeing what other people saw . Seeing how my work spoke to people with an array of tools at their disposal. Tyler, the other Dance On Bones director who is an alum of the Ilkhom training program, works as the liaison between the American artists and the Uzbek artists; fluidly translating hours of rehearsal and artistic choices between actors, directors, designers, and musicians. Sanjar and Tyler (L and R)begin layering in the music for Dance On Bones. When Sanjar, the pianist, was added to the mix the work began to take a definitive shape and I could see all of our wheels begin to turn. The rest of the Uzbek musicians were added during our technical rehearsals, the piece began to pop and crackle, pieces began t fall into place. The musicians riffed on Ennio Morricone’s theme for The Good the Bad and The Ugly filling out the “Showdown at the End of the World” with a distinct American flair. The days went by fast and I was amazed at how quickly these artists (actors, directors, designers) were making bold choices and bringing this work to life. 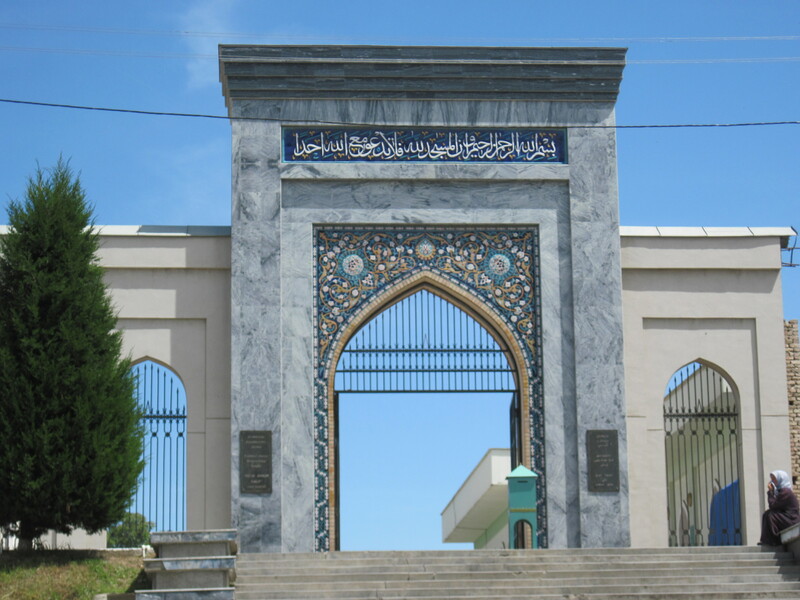 Entrance in the Old City, Tashkent. 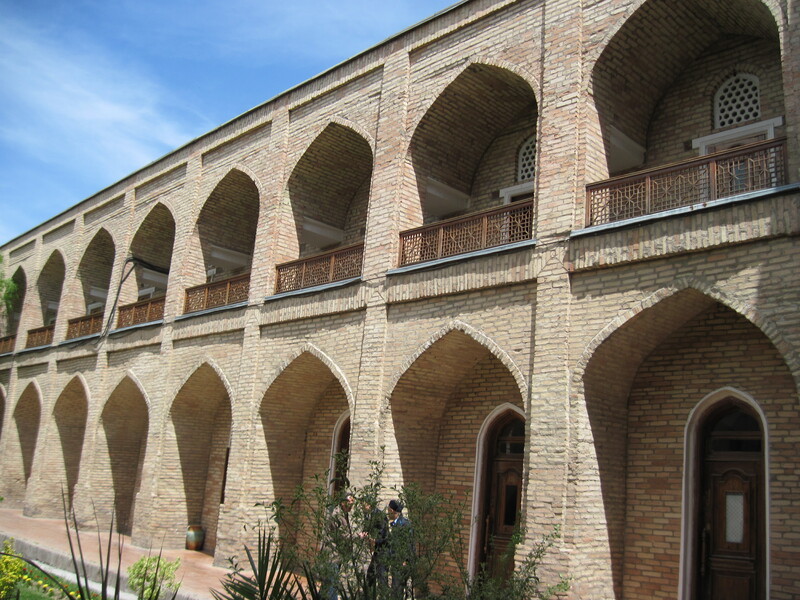 Courtyard of historic school in the Old City, Tashkent. 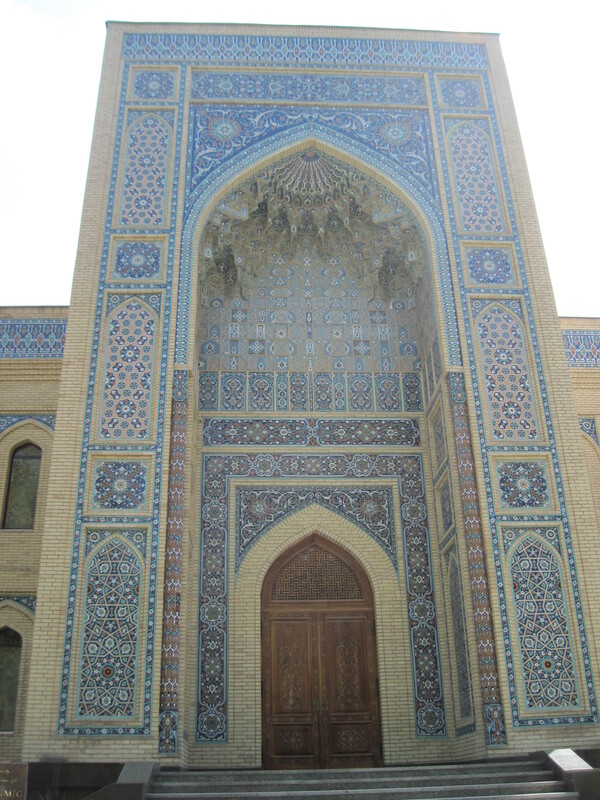 Entrance to a Mosque in the Old City, Tashkent. As the days quickly disappeared until May 1st was upon us and it is time to present a playwriting workshop as well as Dance On Bones as part of the Festival of American Culture. What is the Festival of American Culture? The Ilkhom Theater of Mark Weil presents Days of American Culture in Tashkent, Uzbekistan from April 27 – May 9, 2014. Featuring readings of Caridad Svich’s “Archipelago” (in Russian) Mark Chrisler’s “Worse than Tigers” (in Russian/English) and Dave White’s “Dance on Bones” (in English) the festival also included workshops by visiting guest artists from the United States; a presentation of The Seagull by Seattle’s The Seagull Project; and a concert of American classic rock music performed by Uzbek and American musicians. In 2013, the first Days of American Culture was curated by John Freedman, critic of the Moscow Times and featured improvisations of works by Nilo Cruz, Suzan-Lori Parks, and Deborah Zoe Laufer. We didn’t set an alarm. Waking up after breakfast (which the Shodlik served until 10 a.m. each day included with room), we were thrilled to have saved our extra muffins and bagels from the flight (and also that we remembered to pack a quart baggie of nuts and dried fruit). It was late morning and we could see the mountains from our room. Close-up of mountains from Shodlik Palace. Our phone rang and Irina (our gracious, brilliant host from the Ilkhom Theatre of Mark Weil), was waiting in the Lobby. We left the hotel and walked around the corner to the Ilkhom (it’s in the same complex as the Shodlik). As we entered the theatre, the cast of Dance On Bones are just wrapping up rehearsals in the gallery located in the lobby. Dance On Bones rehearsal in the gallery at the Ilkhom Theatre. We shake quick hands (I did my best to remember names: CT, John, Dave, and Alex) and Gavin, one of the directors promised to connect after giving notes. We were thrilled to find a bustling coffee shop in the lobby of the Ilkhom Theatre and ordered two espressos to take the edge off of the jetlag. Thank goodness it worked. After a brief chat with Gavin talking about my sitting in on rehearsals, questions about the play, and a general excitement to get to know each other, we head from the theatre to a Kafe on Navoiy that becomes affectionately known as Chez Aziz because of the waiter, Aziz, who charms us all with his passion about being an interpreter and tour guide (also the Kafe has very reasonable prices, good service, and cold beer). Our lunch of tomato, cucumber, and onion salad; kabobs; and Shurpa (a soup) tastes wonderful eaten in the spring sunshine. We meet more members of The Seagull Project at the Kafe and chat through lunch. 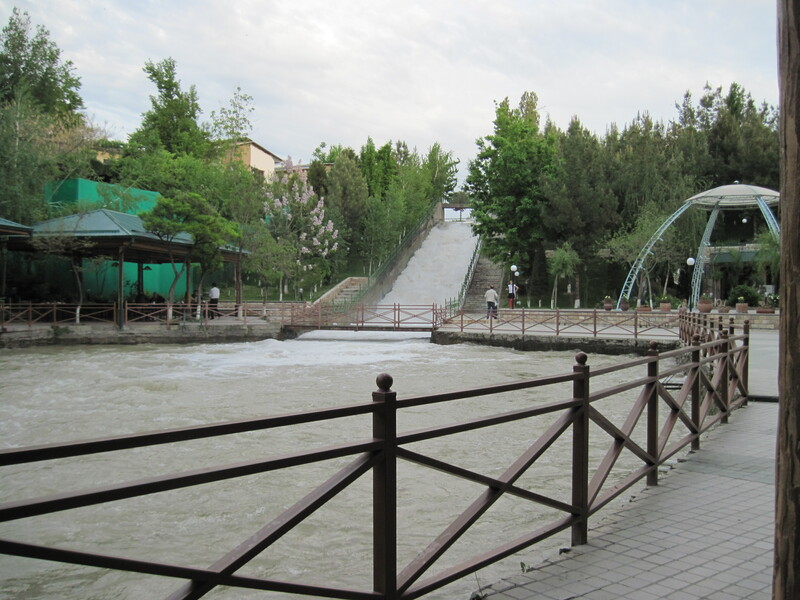 Then Rebecca and I take a long walk through a beautiful park alongside a flowing river, kids jumping off the Navoiy bridge, folks picnicking, and just across that river was more park to be explored. Find a bodega (just a couple of blocks up Navoiy), buy some juice and Q-tips, and get back to the Shodlik Palace before seeing that evening’s show: Mark Weil’s musical adaptation of John Steinbeck’s Tortilla Flat in which Tyler, the other director of Dance On Bones and an Ilkhom training program alum, was going to be acting. 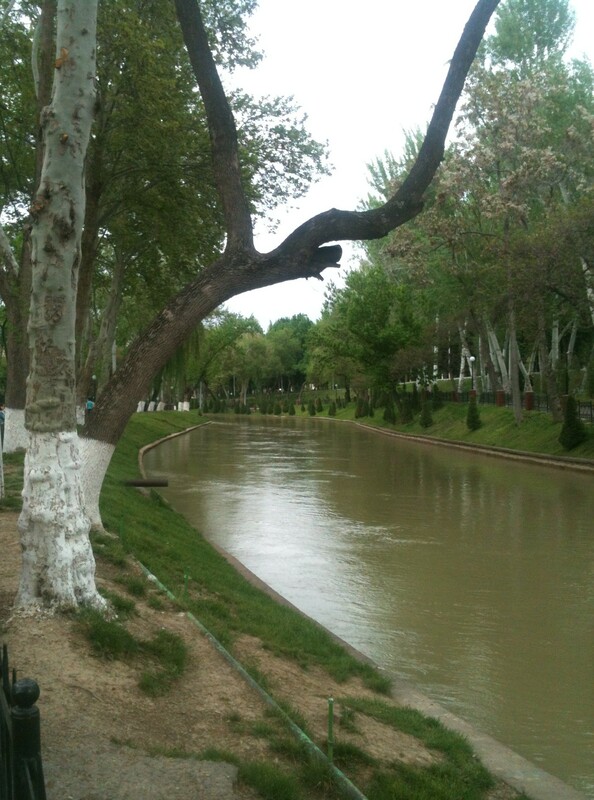 Park along the river off of Navoiy in Tashkent. The following day I was going to sit in on rehearsals (we had 3 rehearsals and a tech day before we presented Dance On Bones), and as excited as I was to get to know everyone, I was also nervous…nervous that this script, this wild idea wrought in the spirit of jazz and the shadows of capitalism/fascism and ecological disaster, would be just that…a disaster and because of that people wouldn’t like me. I was ready to work, and hoped that everyone else would be too. What is the Seagull Project? The Seagull Project was formed out of a passion for the works of Anton Chekhov, particularly his play, The Seagull. Having met and collaborated on Seattle Shakespeare Company’s wildly successful Threepenny Opera, the founding producers immediately set about creating a new collaboration, one formed around a long-form, actor-driven workshop of Chekhov’s play. 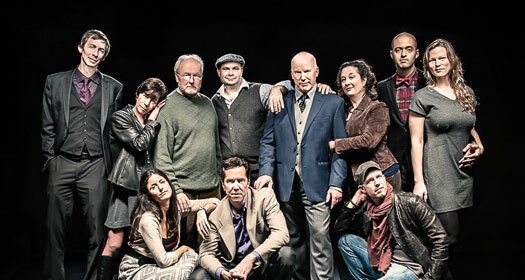 They began assembling an ensemble in 2011, and finally completed their cast in spring of 2012, when they began meeting regularly at the University of Washington, and later at Seattle Children’s Theatre, for weekly sessions in which they trained physically, and began to revisit the fundamentals of their craft as actors. These sessions began in a free-form model in which ensemble members shared their personal training Seagull Reading and Luncheon 046regimens, methodologies, and made dramaturgical presentations on a wide range of topics, from transportation systems in Russia during the 19th Century, to the history of the great Russian estates under the czars, and explorations of Russian music. 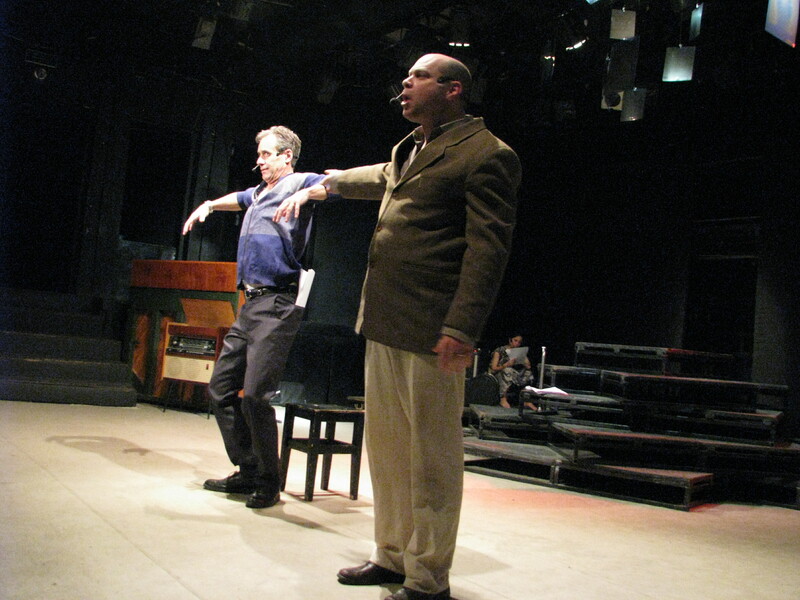 Gradually, with the addition of Seattle actor and University of Washington theater professor Mark Jenkins, the sessions matured into open explorations of The Seagull itself, beginning with very slow readings of the text and progressing to scene work in which the entire ensemble offered feedback for one another. When Ilkhom Theatre (Tashkent, Uzbekistan) veteran Tyler Polumsky joined the ensemble in the spring of 2011, the final element of the workshop crystalized. Tyler’s highly physical approach to theater allowed the ensemble a rare opportunity to explore in a purely physical and kinesthetic way the world of their characters. 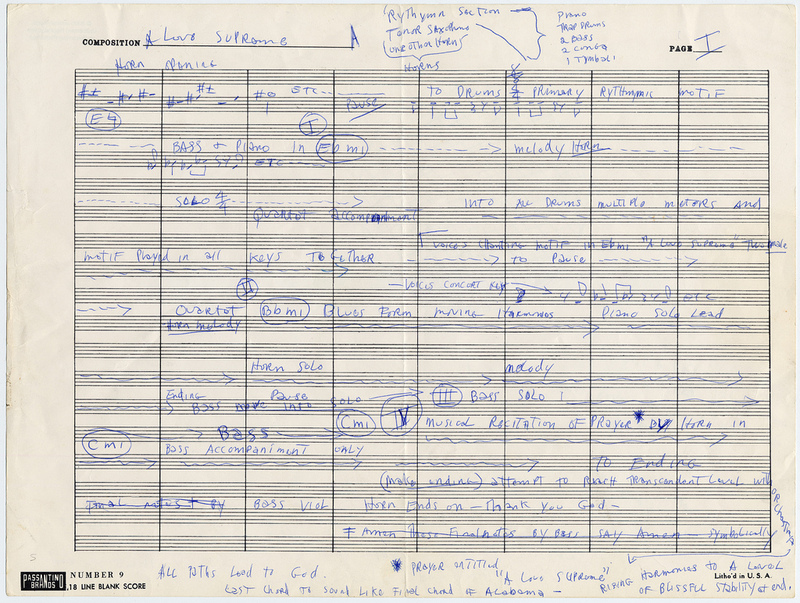 Later, the process of creating “etudes,” or inventive character sketches, deepened the ensemble work, and allowed them to creatively approach off-stage moments, or moments from the character’s past. 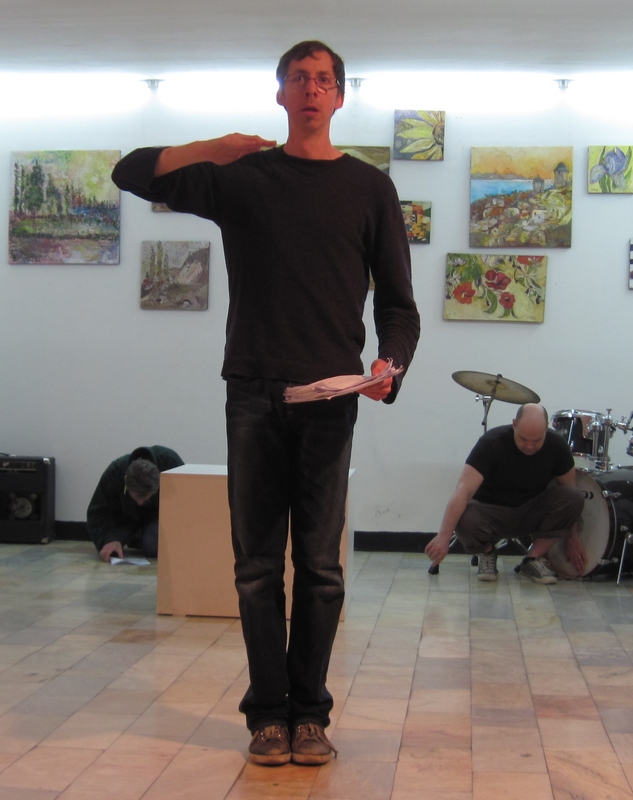 In December of 2012, the ensemble began working with their director, John Langs (The Adding Machine, Hamlet) in daily sessions in preparation for the full production, which opens on January 25, 2013 at ACT Theatre in Seattle. The Seagull Project founding producers are Brandon J Simmons, Julie Briskman, John Bogar, Alexandra Tavares and Gavin Reub. Having booked us a flight on Turkish Air (a great decision, they ran right on time and had amenities missing from many other airlines: warm lemon towels, decent food, some leg room, a “travel kit”, etc.) 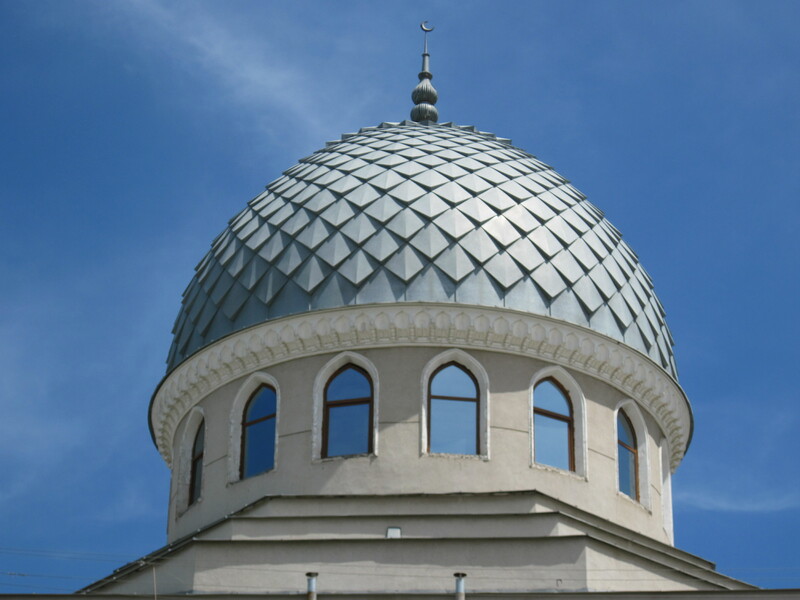 we traveled from Dulles (Washington, DC) to Istanbul (2 hour layover) to Tashkent. Arrival time in Tashkent, exactly as my eyes saw it 21.5 hours into the journey. Outside the airport was surprisingly bustling, but we were greeted by a guide with a sign and taken to a taxi outside the airport. We drove by concrete buildings with ornate accents and trees with white paint reaching up their trunks (for pests we’d later learn). Trees in a park on Navoiy Street in Tashkent, Uzbekistan. Our driver from the airport to the hotel was friendly and with a few words of English and a few words of Russian we learned about our Uzbek car and also where to go shopping. Cost: $20 US. From house door to hotel room: 23:10. Worth every minute and crappy movie watched on the flight (Turkish Air has individual monitors for entertainment, I wasn’t forced to watch crappy movies, but who want’s to watch a good movie on a flight? One glimmer of hope: Walter Mitty with Ben Stiller set a pretty nice tone for our adventure). It was 2 a.m. in Tashkent and we had arrived at the Shodlik Palace Hotel. Exhausted and exhilarated, that tingly travel feel of not quite knowing where or when you are. We took our luggage up. A moment later I rode the elevator back down to order our first two Sarbast Green of the trip at Hemingway’s, the 24 hour hotel bar. That night we slept well. 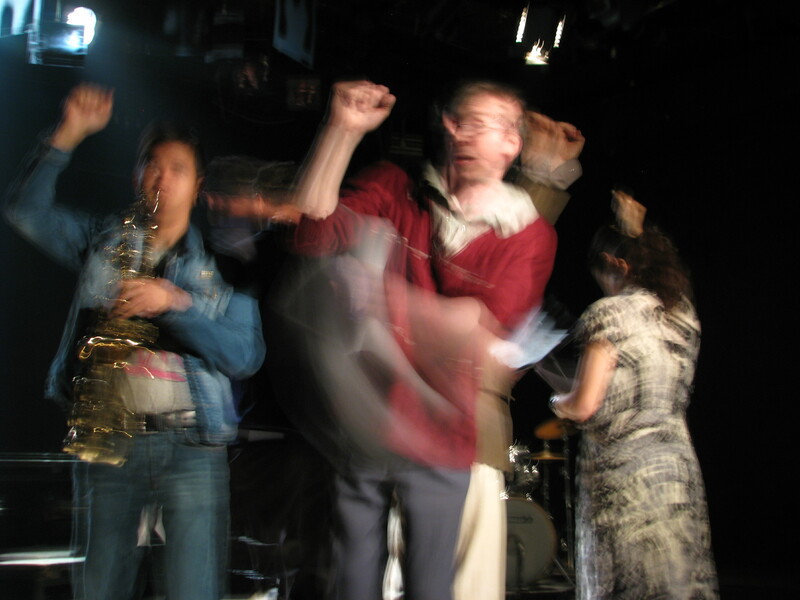 Good thing, too, the following day we’d be looking around the Ilkhom Theatre of Mark Weil and perhaps sitting in on a rehearsal of Dance on Bones. What is the Ilkhom Theatre of Mark Weil? At the present the Ilkhom Theatre remains the only theatre collective in Central Asia with the ability to realize the most ambitious projects, while retaining its political and artistic independence. The Ilkhom Theatre of Mark Weil is the only professional independent performing arts organization in Uzbekistan was founded in 1976 by legendary director Mark Weil. The Ilkhom Theatre has always been known as a destination of intellectuals’ pilgrimage, a place of concentration and creating of modern cultural environment. The Ilkhom has never been a political figure; nevertheless, this fact didn’t prevent the theatre and its artistic director from being blamed for non-conformism in the years of stagnation in 1980s as well as from being ignored by the power and state bodies supporting culture in the post-Soviet years. The Ilkhom Theatre of Mark Weil was the first independent theatre in the Soviet Union. It remains self supporting to this day. Today this cultural center presents up to 200 performances for more than 25000 spectators a year, runs the whole number of international festival and music programs, the organization’s exhibition space operates up to 8-10 art, photo, visual arts expositions and installations, educational programs of the company outreach wide spectrum of young professionals in visual and performing arts. For the last 20 years the productions of the Ilkhom Theatre have been presented at over 40 international theatre festivals in 21 countries of the world, including USA, Japan, United kingdom, Israel, Germany, Austria, France, Italy, Holland, Denmark, Russia and others. The Ilkhom Theatre has a repertory of plays: from Mark Weil’s musical adaptation of Steinbeck’s Tortilla Flat to Yury Klavdiev’s new piece Water Behind the Wall directed by Vladimir Pankov. They also have a training program in which students train to become part of their company. This program is open to international students. Before I went to Uzbekistan, I was banned in Uzbekistan. Actually I wasn’t banned, but my play Ninjas & Squirrels was pulled from a festival and deemed “too controversial” for the Uzbek community by the U.S. government, in particular some of the folks at the U.S. Embassy. I hope the folks at the Embassy know that there’s no hard feelings, in fact being banned in Uzbekistan (other than the headaches of having to switch scripts mid-stream) may have been one of the best things that could have happened to me or my work. Now, I appreciate the fact that the Embassy may have been looking out for my safety or they may have been looking out for the image of the United States (and Ninja’s & Squirrels paints a pretty bleak picture of the continuing aftermath of the farm crisis). It did seem a bit odd that they had a copy of the script since the fall, but the piece was pulled shortly after the revolution in the Ukraine. Perhaps they were altruistically looking out for the Uzbek people. 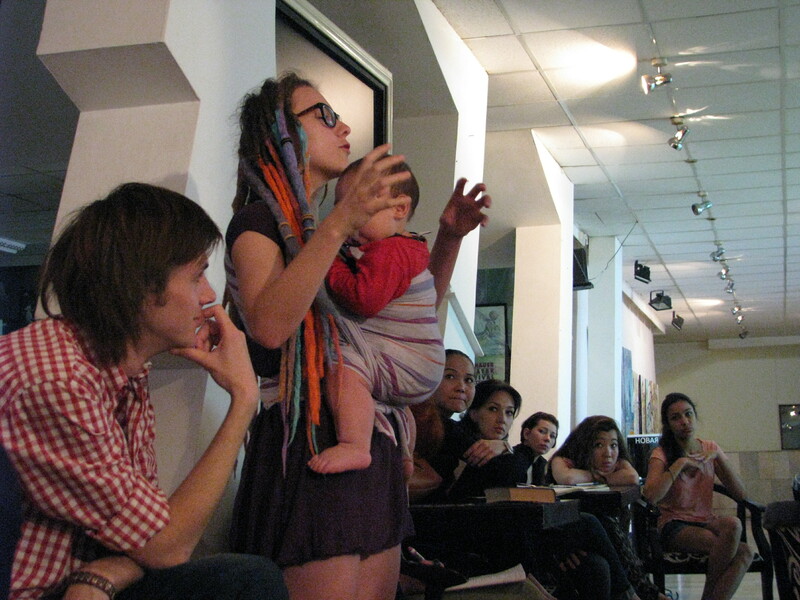 A community in which very few people speak English (and my play was to be presented in English), and a theatre that chose to include my play in a festival they were curating, but the Embassy was funding. The first self-supporting theatre in the USSR. A theatre which had never been censored in its 43 year history. 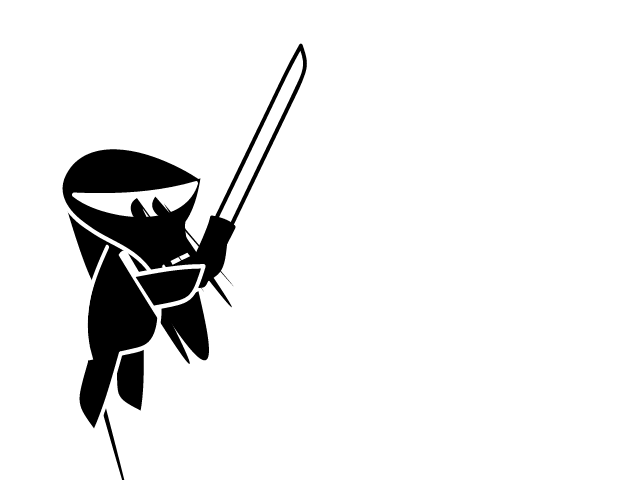 Ninjas & Squirrels is an homage to the work of a contemporary Russian playwright. Said playwright’s work has been presented at the theatre, albeit this work was presented in Russian and therefore outside of the purveyance of the U.S. Embassy (yet is, as of this writing, coming under fire from his own country). Whatever the Embassy’s reasoning, I’d like to believe they had the best intentions and I’m grateful that both they and the Ilkhom Theatre stood by me and my writing. Many things happen for a reason and this may be one of them. 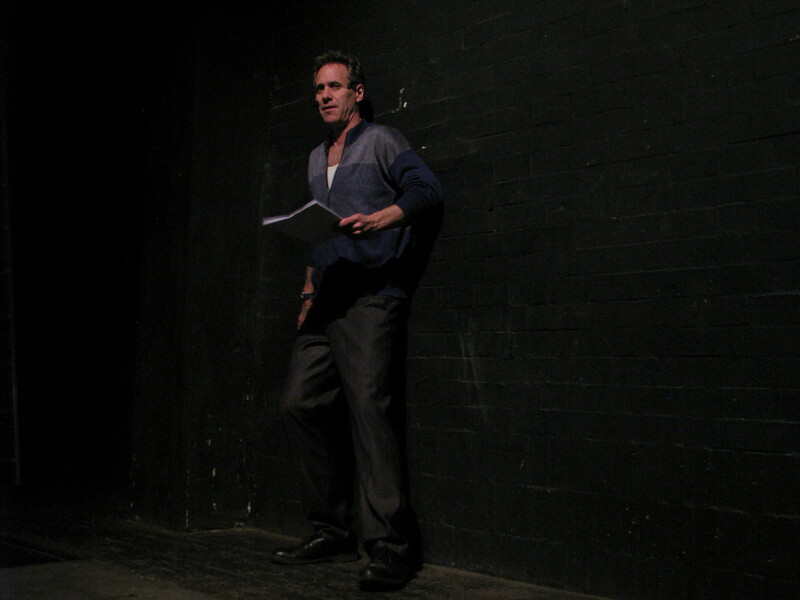 As I stood in the back of the theatre on the night of the reading, I thought about how lucky I was to have been banned by the US in Uzbekistan, because here I was, playing a part in the creation of an experience that spoke to us all in ways far beyond words–a play that pushed the boundaries of what a play could be. Once I realized how deeply Dance On Bones connected to the audience, I realized that the Embassy had created an opportunity by swapping out the more traditional play for an ambitious, ethereal, and experimental work; a work that would not have been complete by the previous deadline. A brand new work with no curse words. And even with all the obstacles thrown in our path by forces beyond our control–we managed to share stories that connected us all. As I hope you’ll see in the coming posts, what resulted was a collaborative process that brought together remarkable American actors and directors, a phenomenal Uzbek jazz quartet, quick-thinking Uzbek designers, AND one non-linear jazz-based script to create a collaborative experience that pushed Dance on Bones into a reality beyond my wildest expectations. But first I have to get to Uzbekistan. What is Dance on Bones? Musicians jamming at The Hat Bar in St. Petersburg, Russia. 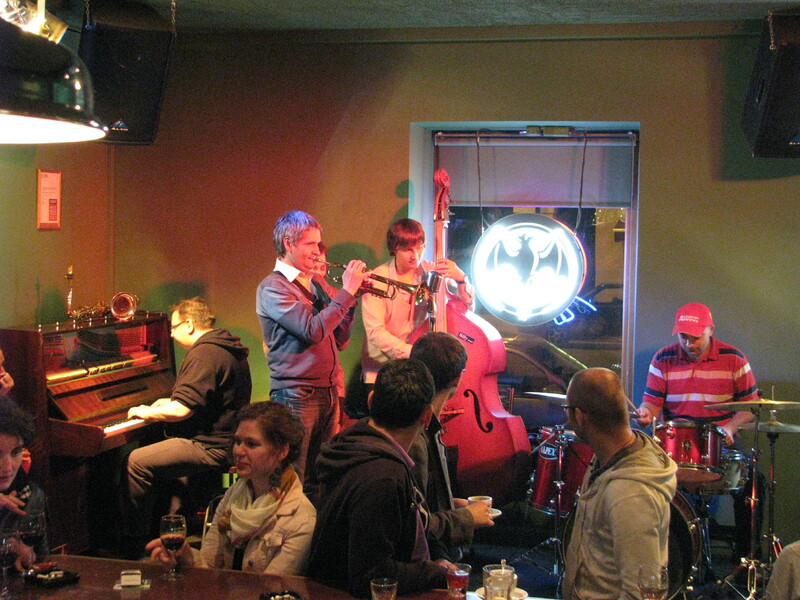 A place where jazz is young again. Some can be performed as monologues. Some of the pages may be stage directions. Some of the pages may be told through images, movement, or puppetry. The pages included after this point can be rearranged. Shuffled into a random order. Performed in a different order each time. Arranged to articulate different ideas. Cultural Fellowships in Russia, a program of the Likhachev Foundation, funded by The Foundation of the First President of Russia Boris N. Yeltsin and the Committee of External Relations of St. Petersburg and The Dramatist’s Guild via Generous Company.